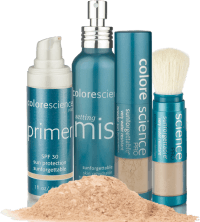 ColoreScience Pro is the premier luxury aesthetic makeup line created to remedy and camouflage specific skin concerns and protect skin from the damaging effects of the sun and environment. The founder, Diane Ranger, ensures every product developed differentiates ColoreScience Pro from other makeup lines through high quality, efficacious ingredients, luxury colors and formulations, and convenience and simplicity of use. You may experience beautiful results without disrupting healthy skin function because ColoreScience Pro is completely free of dyes, talcs, fillers mineral oils and perfumes. Northshore Dermatology knows that what you choose to put on your skin each day matters, and that is why we’ve chosen to offer an extensive selection of ColoreScience Pro cosmetics. This luxury aesthetic makeup line is designed for sun protection, correction, anti-aging, problem skin or enhancement and features eye shadow, lip colors, blushes, and mascaras.